Our handcrafted Aoko Blue Steel knives have an inner core made of high carbon Blue Steel #2 sandwiched in the traditional method of "Warikomi" between two layers of stainless steel. Hand hammering creates an indented pattern called "Tsuchime" which reduces friction and sticking. With a hardness on the Rockwell scale of 62-63, the inner core of Blue Steel #2 is prized for its high edge retention with a stainless steel exterior that is non corrosive and requires low maintenance. 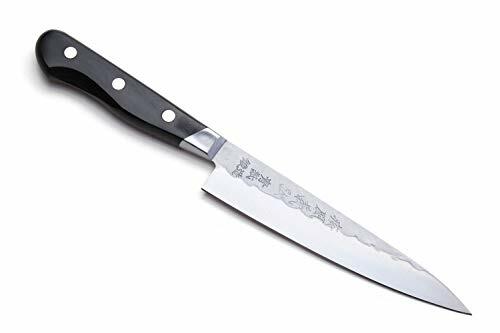 A razor sharp Petty knife can intricately carve and style vegetables and fruits for beautiful presentations and garnishes, performing just as well for bigger jobs such as preparing meals. Our Yoshihiro Ao Ko Blue Steel Petty Knife is forged with particular care to create a medium sized sturdy blade that can maneuver through both small and big jobs with finesse. Even the simplest of tasks are elevated with a handcrafted knife that is as beautiful as it is functional. Available in 5.3 IN (135 mm) with a limited lifetime warranty.